A new study of the genomes of two Woolly Mammoths has been published in the scientific journal “Current Biology”. An international team of researchers have been able to sequence the complete genome of two of these iconic, ancient elephants. 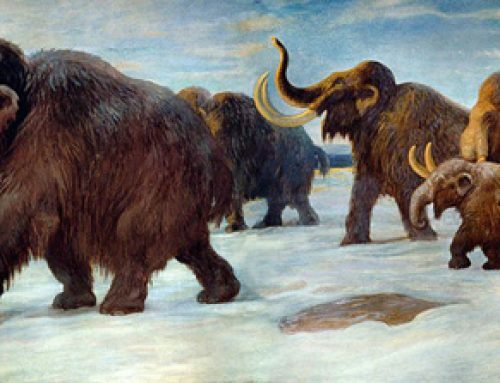 The researchers are not involved in experiments to resurrect a Woolly Mammoth (Mammuthus primigenius), the focus on this research has been on how Mammoth populations declined and the stress the last few Mammoths may have been under before the final population became extinct. Knowing the genetic diversity of isolated populations and searching out evidence of in-breeding as the numbers of a species dwindles, can provide scientists with valuable data to help support conservation efforts for severely endangered species around today. Dr Love Dalén, from the Swedish Museum of Natural History (Stockholm), commented that the first ever publication of the full DNA sequence of the Woolly Mammoth could help those trying to bring this Ice Age creature back, a sort of “de-extinction of the Mammoth”. Great care is taken to prevent contamination of any genetic material recovered. The genome is an organism’s complete set of DNA, the information needed to build and maintain an organism, be it a fungus, a tulip or indeed a Woolly Mammoth. The genome includes all the genes involved with coding proteins and all the non-coding elements of the DNA or RNA. In the case of the Woolly Mammoth, the genome is extremely long, consisting of several billion base pairs or nucleotides (A’s with T’s, C’s with G’s and so forth). The two Mammoths studied came from both geographically and chronologically distant places. The first of the Mammoth genomes sequenced represents a Woolly Mammoth from Wrangel Island dating from approximately 4,300 years ago, one of the very last of the Mammoths to have been alive. The second Mammoth genome represents a specimen from north-eastern Siberia. This one dates from the Late Pleistocene and is estimated to be about 44,800 years old. The genetic research shows that the last remaining Mammoths on the very remote and isolated Wrangel Island suffered from inbreeding. The authors of the scientific paper cannot state categorically that the inbred population was the cause, or contributed to the extinction of this species, however, although inbreeding sometimes does not have a detrimental effect on a population it can do and therefore the results of this study make inbreeding a potentially significant factor in the demise of the Woolly Mammoth. The 40,000 year time difference between the two samples enabled the molecular clock of the Woolly Mammoth to be re-calibrated. A molecular clock for an organism is a very simple concept. If it is assumed that the rate of genetic change (mutation) is relatively constant, then by comparing the genomes of two animals which died at different times will show the amount of difference in the genetic material over this time period. The research team describe two “bottlenecks” that occurred in the history of the Woolly Mammoth, each bottleneck leading to a reduction in animal numbers and a reduction in the genetic diversity of the Woolly Mammoth. We note that Associate Professor Beth Shapiro (University of California, Santa Cruz) has commented on this particular piece of Mammoth research. Beth is an evolutionary biologist and a pioneer in ancient DNA research, and one of Everything Dinosaur’s team members is currently reading her newly published book “How to Clone a Mammoth”. The science of de-extinction by Beth Shapiro. In this excellent book, Beth, discusses the joys of hunting for Mammoth remains in the Arctic tundra. She recounts an amusing tale when Dr. Dalén was asked to participate in a television documentary all about the hunt for Woolly Mammoth fossils. It seems that sometimes, documentary makers have to have quite a bit of poetic licence when it comes to programme making, fossils, even those of three tonne elephants don’t always appear when they are supposed to. This might be an important step, but scientists remain a long way from Woolly Mammoth cloning and for the moment Mammoth de-extinction will require a number of other important breakthroughs in genetic research before we can see these ancient elephants roaming the Arctic tundra. Last month, Everything Dinosaur reported on research carried out by Harvard Medical School that resulted in genetic material from a Woolly Mammoth being inserted into the skin cells from an Asian elephant which were being grown in a petri dish.